I attended a fun-filled event today on a warm, sunny afternoon in Pasadena, Calif. 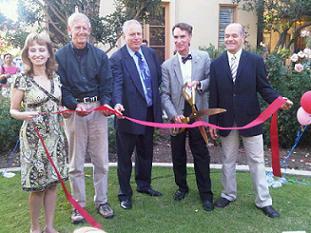 It was the grand opening and open house for the Planetary Society’s new headquarters. A couple of hundred space enthusiasts, including quite a few kids, were on hand to enjoy the festivities - including refreshing access to a well stocked ice cream truck parked on the street. Founded in 1980 by Carl Sagan, Bruce Murray and Louis Friedman, the non-profit Planetary Society inspires and involves Earth’s people in space exploration – through advocacy, projects, and education. The new headquarters at 85 S. Grand Avenue is a long time coming; the old classic Pasadena craftsman house that served as the society’s office for so many years finally had no room left. A change was mandatory, and what a change it is. The new HQ isn’t just another pretty place (but it is mighty elegant looking). The two story structure has enough office space for future needs and the grounds are big enough to hold some very nice outdoor functions. I enjoyed browsing around the office and the informative displays they had set up for the event. They were showing off the science behind the upcoming LightSail solar sail mission, and a computer was set up to sign an electronic birthday card for SciFi author Ray Bradbury who turns 90. The Planetary Society also gets a new executive director, Bill Nye “The Science Guy” who takes the reins from long-time director Louis Friedman who is retiring. I overheard the staff saying that even though Friedman’s stewardship has been superb, Nye will bring a whole different type of energy to the organization. I’ve been a member of the Planetary Society for many years, and I feel it is a very worthwhile organization in terms of the advocacy for science that it provides.